The ferry boats that take you to various beaches offer some of the best views of Sydney. We took a half hour ferry ride to Manly Beach - nice beach in a touristy town with loads of souvenir and surf clothing shops. It's Sam from yr 12 (MSJ) ...I met dave a few days ago at school. 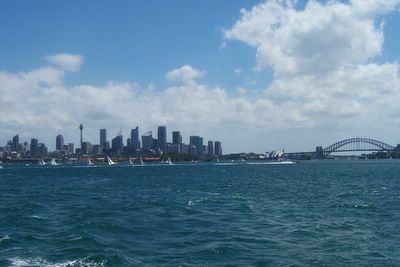 It's quite interesting to see your fascination with the sights in Sydney...it all seems quite "ho-hum" for many of us. In a way we can see now how nice Syd really is. Glad you're enjoying your stay!! Hope it continues.